Preparing crab legs is a simple process and can be done in just a couple of minutes. Knowing how to cook crab legs is something every seafood lover should learn. Here is a basic recipe for cooking crab legs. 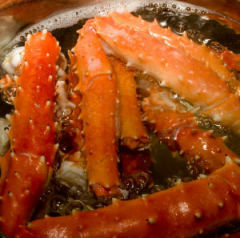 To stem crab legs, pour 2 cups of hot water into a large pot. Add 1 tablespoon of salt and bring to a rapid boil. Add your crab legs and let the water resume boiling. After the water has began to boil, cook for 5-7 minutes. Your crab legs are now ready to enjoy. When serving crab legs, your choice of side dishes is endless. Artichokes go particularly well with crab legs. Also a crusted bread could serve as a side dish. Many people like melted butter and lemon with their crab legs so make sure to offer this option. Pinot gris is a great wine to pair with your crab legs. Crab legs are not only tasty, but they can benefit your health. Crab is a great source of lean protein and omega-3 fatty acids. Crab is a great food choice for diabetics.